Heritage Farm entries dominated the top of the leaderboard in the $50,000 USHJA International Hunter Derby at HITS-on-the-Hudson VI, but the blue went to young professional Geoffrey Hesslink, who rides out of Heritage with Andre Dignelli. Hesslink captured the win atop his stunning chestnut Cadoretto. In the classic round, Hesslink and Cadoretto earned a score of 175, which placed them in third, 3 points shy of Heritage Farm trainer Patricia Griffith, who earned the high score of 178 atop Fetching. Tracy Fenney split the Heritage Farm stablemates with her score of 177 on MTM Outbid. Last week, Fenney claimed top honors in the $50,000 USHJA International Hunter Derby at HITS-on-the-Hudson V atop MTM Outbid. 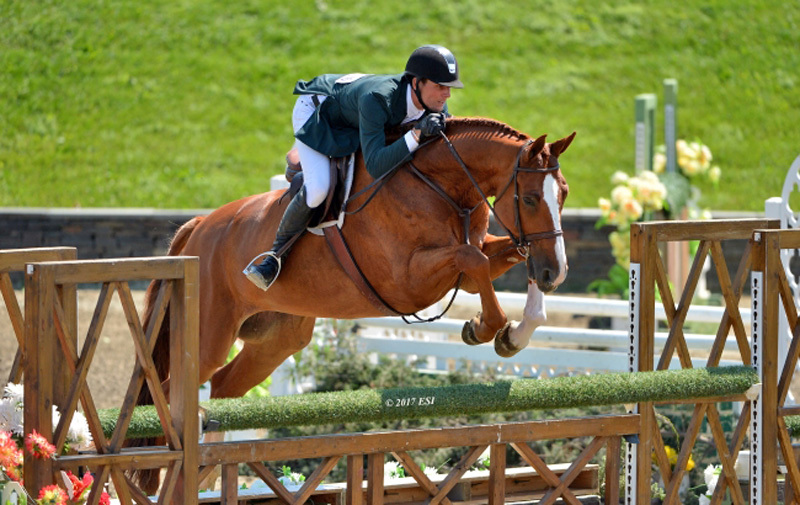 Hesslink owns Cadoretto himself, and the 6-year-old Oldenburg gelding just started showing in the United States in May, making his hunter debut in the Old Salem (N.Y.) in May in the green hunters and were eighth in the USHJA International Hunter Derby there. Cadoretto moved up to the high performance division in July and was fifth in the derby there. “I bought him at the end of February, and this is our biggest win by far,” noted Hesslink. In the second round, Hesslink showcased Cadoretto’s handiness every step of the way while opting for each of the higher height jumps to maximize bonus points. The lovely pair garnered the high score of 191, which combined with their first-round score of 175 produced the overall highest score of 366. Griffith, aboard Lexi Maounis’ Fetching, collected a second-round score of 185. When combined with their first-round score of 178, the elegant duo achieved an overall score of 363 to place second. When Fenney’s student Brian Moggre, had quietly entered the second-round, he and Abigail Albrecht’s MTM Noteworthy stood in fifth place with a first-round score of 168. The pair delivered a stylish round over the handy course and earned a score of 181.5, which increased their overall score to 349.5 and third place. See full results of the $50,000 USHJA International Hunter Derby.